Today we are updating the web version of Bump at http://bu.mp to be universally compatible with Bump on iOS and Android. This means that starting today, everything you can bump between phones now also works both to and from any computer in the world. Photos, videos, contacts, files…everything. 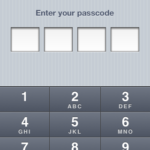 There’s no setup at all — just go to http://bu.mp on your computer, open Bump on your phone, and bump the spacebar key! Bump is now your unlimited USB flash drive that is always with you! Moving files from your computer to iPhone is extremely simple. Visit http://bu.mp on your computer, launch Bump on your iPhone then bump the spacebar. Once connected you’ll be able to select a file from your computer to send to your iPhone. 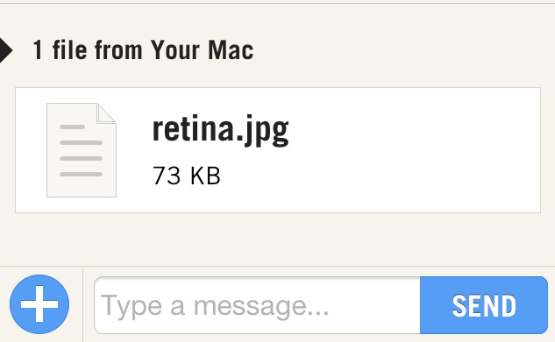 Bump on the iPhone will confirm you have received a file from your Mac. You can access your received files within the “Files” tab on the main screen of Bump. This is a pretty awesome service and it works exactly as described. Kudos to Bump for making this awesome feature. Let us know how this update to Bump on the web works for you. 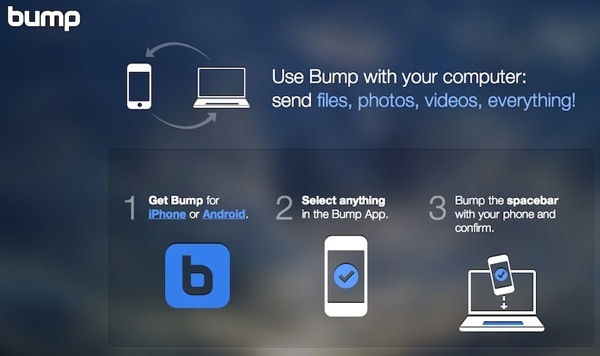 Update: The updated Bump iOS app has been released to support this update. Try it again with this app if you’re running into problems.